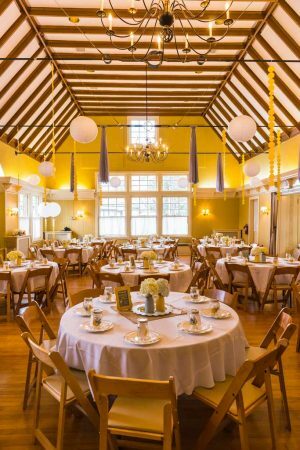 Every article you read about budget-friendly weddings will tell you, they #1 way to save money is to find a wedding venue like the Saturday Clubhouse that lets you bring in your own caterer and alcohol. If you don’t have a caterer in mind, we have a list of great caterers that we can recommend. Imagine how much money you can save by buying your alcohol in and being able to return unopened bottles after your event! On top of all that, many budget saavy couples opt for a Sunday rental which offers a significant cost savings. Beyond the money you can save on food and alcohol, our Clubhouse is more than just an affordable wedding venue. The Saturday Club is one of our nations first women’s clubs and continues to have a thriving membership that serves local organizations through philanthropy and volunteerism. The Clubhouse was built in 1898 to house the Club’s activities and was designed to resemble William Shakespeare’s Tudor cottage. The building is listed on the National Register of Historic Places and rental income helps us preserve and maintain this historic treasure. Our venue can accommodate 120 wedding guests for a seated dinner, 100 for a seated dinner with a dancing area, and 150 for a standing cocktail party. As soon as the previous event wraps up, you can start transforming the ballroom with your wedding’s themed decorations. Sometimes, days in advance. Couples often use our elevated stage for their first dance or its a great spot for the DJ or band. We also have a grand piano if you’d like a little dinner music. We work with you to set up the space how you want it. Many couples opt to hold both their ceremony and reception in our space. “I fell in love with this place the moment I saw it. The design of the building was an exact fit for my vintage wedding theme. I was greeted by the Director, Joyce Dugan, who exuded professionalism and friendliness from start to finish. She provided me with detail information on the building which seated about 120 of my guest and was instrumental in different ideas for my ceremony. I knew I was in good hands when she informed me of the venue’s various acts of philanthropy. From the early 1900’s, The Saturday Club has provided their building and services for local organizations and has dedicated their commitment to the local community. What actually sold me was the fact the monies they receive from renting out their venue are donated to a local support group for battered women. From a personal stand point, this spoke volumes and I looked no further! Of course there were perks, such as being able to provide my own entertainment, caterer and alcohol. If you are looking to hold more than 120 people for a sit-down dinner this may not be the place for you. 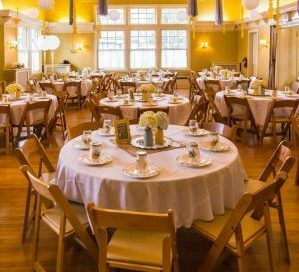 However, we utilized every space possible as they have cushioned seating in addition to the round and long tables that they provide. The maintenance worker, Chris was very helpful as well in our planning. We planned our wedding in 30 days and made it work. It would not have been possible without Joy Dugan and the lovely Saturday Club! With it’s central Philadelphia suburban Main Line location in Wayne, PA, the Saturday Clubhouse is an easy drive from many places of worship and popular wedding ceremony locations in King of Prussia, Villanova, Bryn Mawr, Newtown Square, Devon, Berwyn, Paoli, or Ardmore. We are within walking distance of 5 churches in downtown Wayne.